Bulk Raw Blue Agave (UWC) Amber 55 (55 lbs. 25 Kg.) $0.10 per Oz. 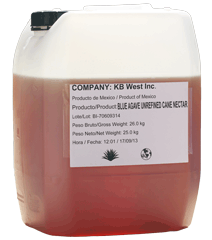 Our Raw Blue Agave Unrefined Whole Cane (UWC) Nectar has a mild and pleasant flavor that is excellent for all your baking applications. Wonderful to sweeten beverages, coffee, fruit smoothies, lemonades, and Fresh-squeezed Skinny Margaritas... Salud! An all around natural sweetener for your restaurant, cafe and all prepared foods applications.